Picture - An early PB2Y-2 in flight. The PB2Y Coronado was a large flying boat patrol bomber designed by Consolidated Aircraft. As of 2005, one Coronado remains at the Pensacola, Florida National Museum of Naval Aviation. Picture - A Coronado moored at NAS Jacksonville during the war. After deliveries of the PBY Catalina, also a Consolidated aircraft, began in 1935, the United States Navy began planning for the next generation of patrol bombers. Orders for two prototypes, the XPB2Y-1 and the Sikorsky XPBS-1, were placed in 1936; the prototype Coronado first flew in December 1937. After trials with the XPB2Y-1 prototype revealed some stability issues, the design was finalized as the PB2Y-2, with a large cantilever wing, twin tail, and four Pratt & Whitney R-1830 radial engines. 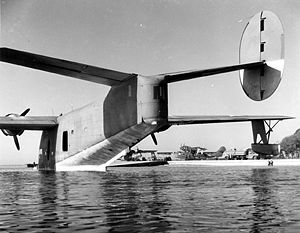 The two inner engines were fitted with four-bladed reversible pitch propellers; the outer engines had standard three-bladed feathering props. (However, note the three-bladed prop on the inner engine in the picture at the left.) Like the PBY Catalina before it, the PB2Y's wingtip floats retracted to reduce drag and increase range, with the floats' buoyant hulls acting as the wingtips when retracted. Development continued throughout the war. The PB2Y-3, featuring self-sealing fuel tanks and additional armor, entered service just after the attack on Pearl Harbor and formed most of the early-war Coronado fleet. The prototype XPB2Y-4 was powered by four Wright R-2600 radials and offered improved performance, but the increases were not enough to justify a full fleet update. However, most PB2Y-3 models were converted to the PB2Y-5 standard, with the R-1830 engines replaced with single-stage R-1830-92 models. As most existing PB2Y-3s were used as transports, flying low to avoid combat, removing the excess weight of unneeded superchargers allowed an increased payload without harming low-altitude performance. Picture - Coronados and Catalinas at RAF Darrell's Island, Bermuda. Coronados served in combat in the Pacific, in both bombing and anti-submarine roles, but transport and hospital aircraft were the most common. 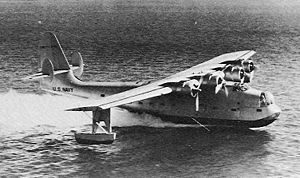 The British Royal Air Force Coastal Command had hoped to use the Coronado as a maritime patrol bomber, as it already used the PBY Catalina. However, the range of the Coronado (1,070 miles) compared poorly with the Catalina (2,520 mi), and the Short Sunderland (1,780 mi). Consequently, the Coronados supplied to the RAF under Lend-Lease were outfitted purely as transports, serving with RAF Transport Command. 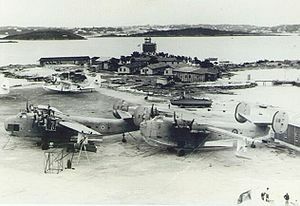 The 10 aircraft were used for trans-Atlantic flights, staging through the RAF base at Darrell's Island, Bermuda, and Puerto Rico, though the aircraft were used to deliver vital cargo and equipment in a transportation network that stretched down both sides of the Atlantic, from Newfoundland, to Brazil, and to Nigeria, and other parts of Africa. After the war ended 5 of the RAF aircraft were scrapped, one was already lost in collision with a Martin Mariner and the last four were scuttled off the coast of Bermuda in 1946. Coronados served as a major component in the Naval Air Transport Service (NATS) during World War II in the Pacific theater. Most had originally been acquired as combat patrol aircraft, but the limitations noted above quickly relegated them to transport service in the American naval air fleet also. By the end of World War II the Coronado was outmoded as both a bomber and a transport, and virtually all of them were quickly scrapped, being melted down to aluminum ingots and sold as metal scrap. Picture - The XPB2Y-1 prototype with a single tail in 1938. Prototype with four 1050hp XR-1830-72 engines, one built. Evalutation variant with four 1020hp R-1830-78 engines, modified hull and six 0.5in guns, six built. One PB2Y-2 converted as prototype for PB2Y-3. Production variant with four 1200hp R-1830-88 engines and eight 0.5in guns, 210 built. Lend-lease designation for Royal Air Force aircraft. 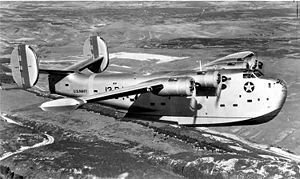 PB2Y-3s converted as freighters with faired-over turrets, side loading hatch, and seating for 44 passengers, 31 built. One PB2Y-2 re-engined with four R-2600 engines. The XP2BY-3 converted as PB2Y-5 prototype. PB2Y-3s converted with four 1200hp R-1830-92 engines, increased fuel capacity and provision for RATO (rocket assisted take-off) gear. PB2Y-5s converted as unarmed transports some fitted for medical evacuation role. Andrews, Hal. ""PB2Y Coronado"" Naval Aviation News, Vol. 72, Issue no. 1, November-December 1989. ISSN 0028-1417. Bridgeman, Leonard. “The Consolidated Vultee Model 29 Coronado.” Jane's Fighting Aircraft of World War II. London: Studio, 1946. ISBN 1-85170-493-0. Hoffman, Richard Capt. USN (ret.). Consolidated PB2Y Coronado (Naval Fighters 85). Simi Valley, California, USA: Ginter Books, 2009. 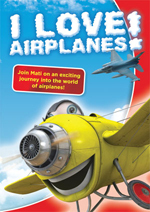 ISBN 978-0942612851. 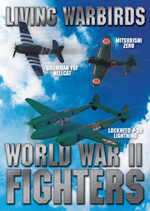 March, Daniel J. British Warplanes of World War II. Rochester, Kent, UK: Grange Books Plc., 2000. 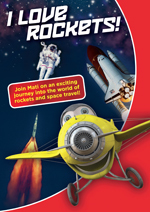 ISBN 1-84013-391-0. Mondey, David. 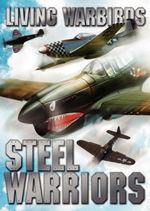 The Hamlyn Concise Guide to American Aircraft of World War II. London: Hamlyn Publishing Group Ltd., 1982 (republished 1996 by the Chancellor Press, reprinted 2002). ISBN 1-85152-706-0.